While the eyes of the hockey world have been focused on the Stanley Cup final, the Sharks and Penguins weren’t the only players under a spotlight this week. The annual NHL Scouting Combine has been going on all week in Buffalo, and it will wrap up Saturday with 114 of the world’s top draft-eligible prospects expected to gather for a day of fitness testing and other events designed to help teams make their final evaluations. While portions of the proceedings are open to the media, much of day’s events take place behind closed doors, and would typically remain a mystery to the average fan. Luckily, DGB spies were able to infiltrate this year’s combine and obtain a copy of the top secret itinerary waiting for each of the attending prospects. 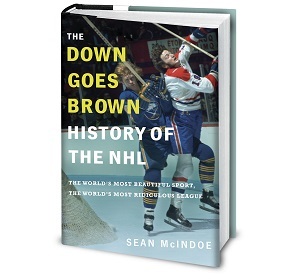 We’re publishing it here for the public; read it now before the NHL’s lawyers find out and make us take it down. 9:00 a.m. – Welcome and opening remarks. Commissioner Gary Bettman welcomes the prospects to the day's events, briefly runs through the day's schedule, and asks if anyone has any questions. 9:01 a.m. – A clearly exasperated Bettman explains that no, he still does not have any updates on a timetable for Las Vegas expansion. 9:30 a.m. – Workshop: "So you've been drafted by Edmonton." In this interactive workshop, prospects will practice hearing their names called by the Oilers until they can ensure that they won't make any facial expressions that the media in every other city will interpret as unhappiness and talk about until the end of time. Special guest appearance by Connor McDavid. 10:00 a.m. – Combine test: Weight-Lifting. Prospects will demonstrate their ability to lift 150 lbs of barbells with their arms and chest, with the exception of Auston Matthews, who will instead be offered the opportunity to lift 49 years of one city's neurosis onto his back. 10:30 a.m. – Combine test: Wingate Ergometer Test. In this infamous stationary cycling exercise, prospects will demonstrate their anaerobic fitness levels by pedaling at maximum speed and resistance for as long as possible in an exhausting test of personal endurance. Please note that any prospects who score poorly will immediately be subject to criticism and ridicule from the assembled collection of media members who just got winded lunging for the last cookie in the lunchroom. 11:00 a.m. – Combine test: Standing Long Jump and Vertical Leap. Prospects will take turns measuring their leaping ability through a variety of events, culminating in an attempt to grab an envelope taped to the ceiling which contains an explanation of why exactly anyone should care about how high or far a hockey player can jump. This is an event that hockey enthusiast should look forward too, imagine being pick and playing for NHL. So hockey applicants start practicing and writing your own application letter, check the ones posted on http://www.procustomwriting.com.